From jumping into a Panzer tank and piloting a Spitfire in the skies to supplying squadmates and building new fortifications to protect the team, this is World War 2 like only Battlefield can do. Battlefield™ V, the highly anticipated new game in this award-winning franchise, releases today from DICE, an Electronic Arts Inc. (NASDAQ:EA) studio. During the early access periods, the game has driven the most subscriptions for PC players on Origin Access Premier and Origin Access Basic. 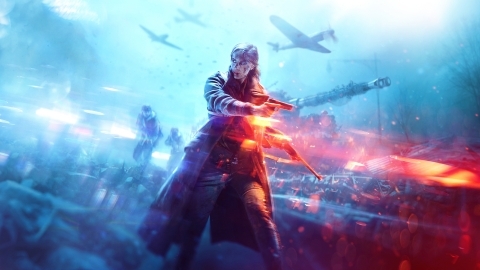 Battlefield V has also seen global critical acclaim with Screen Rant calling it "the best shooter of 2018" and Jeuxvideo.com claiming "the king of FPS is back." "With Battlefield V we set out to build the best playing game in the franchise's history. Few other games are able to provide the kind of amazing and unscripted moments you experience in Battlefield, like pulling off crazy stunts in a plane while flying through a blown-up bridge as tanks and soldiers battle it out on the ground. The team here at DICE can't wait to see what Battlefield V becomes in the hands of our community," said Oskar Gabrielson, GM at DICE. "We have also set out to create a game that will grow and evolve over time, and we're going to keep tinkering with the gameplay, and provide new experiences to our community for a long time to come." Battlefield V gives fans the chance to play the untold stories and visit the unexpected locations of WW2. In multiplayer, DICE builds upon the deepest and most immersive Battlefield experiences yet with massive gameplay changes and the development of new core systems. Whether it's by foot, driving one of the many different armored vehicles or going swiftly by plane, squad up with three others to play the objectives in any given mode and choose between the recon, assault, medic or support class for whatever the team needs most. Players can prepare for battle across the eight maps and eight multiplayer modes and learn more about the game's new innovations by visiting the Boot Camp. On December 4, players can jump into the new single-player War Story, The Last Tiger, a new tank-focused map called Panzerstorm, the introduction of the Practice Range and a chance to stand out on the battlefield with vehicle customizations for both tanks and planes. Additionally, in the same week, Battlefield V will begin time-limited events from the first chapter of its new live service commitment to players, Tides of War. Each new chapter throughout Tides of War will feature evolving gameplay, an expanding world, new experiences and game improvements all completely free, bringing a new Battlefield with each one. For more information on Battlefield V, please visit www.battlefield.com or join the conversation on Facebook,YouTube, and Twitter ®. Press assets for Battlefield are available at http://info.ea.com. Origin, Maxis, The Sims, EA SPORTS, Battlefield, Need for Speed, Dragon Age, and Plants vs. Zombies are trademarks of Electronic Arts Inc. PlayStation is a registered trademark of Sony Computer Entertainment Inc. John Madden, NFL and FIFA are the property of their respective owners and used with permission.